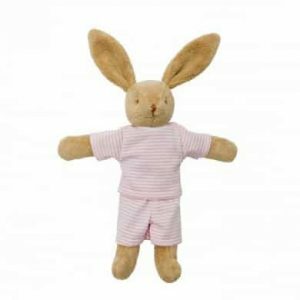 This soft plush bunny in pyjamas is another lovely product from Trousselier. Trousselier is based in Paris, France and have been creating beautiful, detailed toys for thirty years. Using their wealth of knowledge and experience, both manufacturers and designers work together to create a universe of tenderness, imagination, softness and poetry. The perfect christening or birthday gift that will be treasured for a lifetime. In a beautiful pink striped design this is bound to be a hit with your little one.